Back in May, shortly after the 2018 NFL Draft, we published an article with the same exact headline as above, projecting roles for each of the five players the Eagles selected. Now that training camp (the part we're allowed to watch, anyway) and the first three preseason games have come and gone, let's update those projections. Goedert was a nice value pick at 49th overall due to his clear ability to get open and catch the football. We noted in May that having Zach Ertz (6'5, 250), Alshon Jeffery (6'3, 218), and Goedert (6'5, 256) all on the field at the same time is going to present difficult matchups for opposing defenses in the red zone. Goedert will head into this season as the clear-cut No. 2 tight end behind Ertz. After a strong training camp and preseason (9-149-1 in three games), the idea that Goedert can be a weapon in the passing game has not changed. What has changed is the perception of Goedert's blocking. It was thought that Goedert would struggle in that regard early in his career, but he showed encouraging signs as a blocker during the preseason, which might encourage Doug Pederson to employ more two-TE sets all over the field, and not just in red zone situations. Goedert gives the Eagles another weapon in an already loaded offense. Projection: 35 catches, 480 yards, 5 TDs. Last year, we took a look at Jim Schwartz's history of playing rookie cornerbacks, and came to the conclusion that Schwartz is not at all afraid to put inexperienced cover guys on the field. Late in training camp, Maddox threw a scare into Sidney Jones, as he nearly beat out the highly-touted second year corner for the starting slot corner job. It now appears that Jones has secured that job, but Maddox showed that he can play. At some point this season a corner is going to go down. It's inevitable. Maddox will get a chance to play, and I believe he'll be ready to contribute in the slot whenever he is called upon. Projection: He'll need for someone to either get hurt or badly falter to get in the game, but I believe he'll be active on game day and part of the special teams units. The Eagles' depth chart at defensive end is stacked. Sweat is going to make the team, but he'll be behind Brandon Graham, Derek Barnett, Chris Long, Michael Bennett, and assuming he makes the team, Steven Means. Sweat is a legitimately talented player. He is much more than a recent developmental guy like Alex McCalister, for example, but he still needs work. This is a player the Eagles would probably like to "redshirt" on IR for the season, but there's no reason for Sweat to agree to that, as he could easily stick on plenty of other rosters around the league. Projection: Sweat spends the season on the 53, but lands on the inactive list for the season. During training camp, Pryor went from bubble player to stone-cold lock to make the roster, though he has cooled off some over the last two weeks. Pryor owned both defensive ends and defensive tackles during one-on-one's throughout camp, but was not as effective during the preseason games. Still, the Eagles love his versatility as a guy they have cross-trained at RG and RT, and he's going to make the roster. Projection: Pryor won't see the field unless multiple players at either guard or tackle go down. I won't spend a lot of time on Mailata. He's never played football, and has a near zero percent chance of playing in a meaningful game this season. His best hope is to make the 53-man roster while spending the entire season on the inactive list because he showed enough on film that the Eagles don't want him to get poached by some other team at final cutdowns. Otherwise, Mailata has practice squad written all over him. While I would still say that he's not going to see the field in 2018, Mailata is 100 percent going to make the roster. 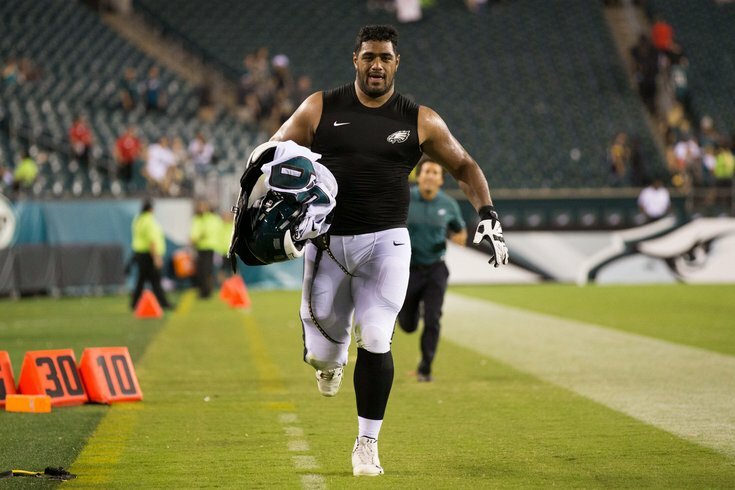 In our most recent 53-man roster projection, we had Mailata going on IR as a redshirt player. I would like to distance myself from that stance as quickly as possible. Mailata was extremely impressive against the Browns, as shown by Tommy Lawlor at IgglesBlitz. The thinking here previously was that Mailata may not be able to give guys like Brandon Graham and Michael Bennett legitimate practice reps, but after seeing the amazing progression of this kid in such a short amount of time, (A) he may be able to give good practice reps after all, and (B) even if he can't, allowing him to practice with the team all year is probably worth it if the team thinks he can be a special player. Projection: Mailata is going to make the 53-man roster, and he's going to stay there for the duration of the season.